In this book, Prof. Fischer (Alan Hancock College), author of several earlier works on Nazi Germany, explores what Hitler believed about America and how it affected the course of the Second World War. He delves into the sources of Hitler’s often contradictory views of America and how these helped bring about his defeat. Fischer finds that Hitler’s ideas about America came from several sources, but two were particularly important, books and people. His wide if unsystematic reading, including the western novels of Karl May, who never visited America, and the racist writings of the American Madison Grant, provided him with a lot of often erroneous ideas. In addition, the opinions of people, some, such as military attaché Friedrich von Boetticher or the half-American businessman Ernst Hanfstaengl, were better judges of the American character than others, as well as Hitler’s own occasional contacts with Americans, many of whom sympathized with his racial and political ideas, such as Charles Lindbergh. Of course, all of these impressions and ideas were, filtered through his essentially racist world view. 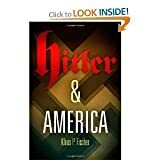 Fischer repeatedly points out how complex and often contradictory Hitler’s ideas about America were, at times very accurate and at others quite wrong. Hitler admired some aspects of American society, such as its economic might and its racial policies, basing some of his own race laws on American examples. But he despised democracy and the “dilution” of Nordic blood that he perceived as a fatal flaw, and he firmly believed the United States was controlled by Jewish interests, echoing many archconservative Americans. This strange mix of ideas effected Hitler’s policies. From the early ‘30s through the early years of World War II, his principal diplomatic aim was to keep America neutral, rightly fearing America’s economic and military might. But as the war dragged on, and the U.S. moved from a neutral to a “non-belligerent” to an open enemy, Hitler’s views tended to become more hostile, and he made an increasing number of mistakes as his situation became more desperate, including last minute attempts to split the “unnatural” Allied coalition. In telling this tale, Fischer brings in a very large supporting cast, including FDR, who had lived in Germany and spoke the language, and had read Mein Kampf in the original, yet who still at times misjudged the nature of the Nazi regime. Fischer touches upon many of the prevailing social and cultural themes of the age and provides a rich, complex work. This make Hitler and America important reading for anyone interested in the origins and conduct of the Second World War.